Claire Adams Spears is an Assistant Professor in Health Promotion & Behavior in the School of Public Health at Georgia State University. Dr. Spears’ research focuses on informing, developing, and evaluating innovative interventions to improve coping with stress, reduce health risk behaviors, and enhance quality of life in underserved populations. She is particularly interested in mindfulness-based approaches and understanding the mechanisms through which these practices might promote healthier behaviors—for example, smoking cessation, lower alcohol use, healthier diet. Her work also focuses on mobile health technology (mHealth) to enhance and disseminate health promotion interventions in diverse populations. 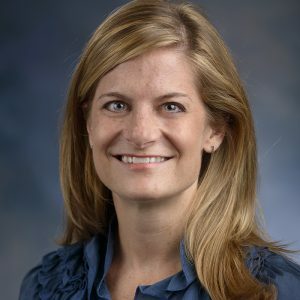 Her research has been funded by the National Center for Complementary and Integrative Health (NCCIH), National Cancer Institute (NCI), and Fogarty International Center of the National Institutes of Health (NIH), as well as Cancer Research UK. Dr. Spears holds a doctorate in Clinical Psychology with a minor in Behavioral Medicine from Louisiana State University and a master’s degree in Psychology from Wake Forest University. She completed a postdoctoral fellowship in Health Disparities Research at the University of Texas MD Anderson Cancer Center. After postdoctoral fellowship, she served as an Instructor in the Department of Health Disparities Research at MD Anderson and a faculty fellow of the Duncan Family Institute for Cancer Prevention and Risk Assessment. Prior to joining the faculty at the School of Public Health in 2016, Dr. Spears served as an Assistant Professor of Psychology at Catholic University in Washington, D.C.